In the second week of August this year, when a severe pest attack ravaged the coconut crop in Neil islands in the South Andamans, the villagers turned to scientists from the Port-Blair-based Central Agricultural Research Institute (cari) for help. But shouldn't officers of the agriculture department of the Andaman and Nicobar islands take care of such problems? They actually don't; so people in the South Andamans prefer getting their agriculture-related problems solved by cari scientists. This was not so till 2001. Till that year, the island's agricultural department supervised farming practices but did precious little to guide farmers. Such callous indifference nearly put paid to the islands' agriculture, with farmers -- most of them are settlers from Bangladesh and South India -- ploughing more and more pesticides into their fields in the hope that yields would be much more. Says R B Rai, director cari, "We really had a tough time convincing farmers that high yields have nothing to do with pesticides. We even told the agriculturists that we would share their losses if our methods do not succeed. Ultimately, our eagerness to help the farmers with their on-field problems helped us to strike a chord with them." He adds that "Ideally the agricultural department should be reaching out to farmers in their fields. But since we have the technology, it is no use keeping it to ourselves." "I am not criticising the agricultural department in any way," he remarks politely. But how are cari's methods different? For one, the institute encourages farmers to take up multi-cropping: traditional paddy farming is combined with floriculture, betel leaf cultivation and banana plantation. Besides, the South Andamanese agriculturists are also supported in taking up poultry farming and pisciculture. Chemical fertilisers and pesticides have been almost totally replaced with organic manure -- such as forest litter and cow dung -- and biopesticides -- such as philomon trap and tobacco decoction. 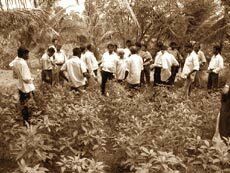 Rai adds that "Farmers who opt for floriculture are advised to grow marigolds adjacent to other crops. This weans insects away from the paddy and vegetable fields. And agriculturists reap dual benefit: they earn from flowers and also reduce their dependence on pesticides." Organic is profitable The new methods have brought some prosperity to quite a few farmers. Pachia Muthu of Prothrapur village notes with some elation that he "Earns Rs 2,000 every month by selling flowers at the market in Port Blair." "Sometimes when winds are favourable, I make as much as Rs 5,000 every month," he adds. Says Jag Narayan a panchayat member from Bhastu, "My village has turned into a wholesale market for vegetables ever since the cari scientists started guiding us. The prices of many vegetables have gone down. For example, tomatoes were priced as high as Rs 25 a kilogramme (kg) earlier; now they sell at Rs 5 a kg." Money from hens The success in other areas has been a little more modest: T Kannan, a 19-year- old farmer from village Mucca Pahad owns a poultry farm where he breeds broilers (cubb-100 variety) with technological guidance from cari. K annan earns about Rs 1,400 by selling a batch of these broilers to private dealers. The institute has also shown ways of breeding a poultry variety of the Nicobarese fowl. Initially, high poultry mortality was a major worry for the farmers. Says Muthu, " cari gave me some 30 Nicobarese fowls; nine of them died soon." According to A Kund of cari, these deaths happened because the Nicobarese fowl was crossbred with another local poultry variety. "We have told the villagers to avoid cross breeding and deaths have become quite minimal now." On cari's anvil today are plans to distribute black pepper saplings to 50,000 farmers in the islands. These creepers will be raised on Jatropha trees -- commonly used throughout the islands for fencing. "These plants have been cultured within cari. So, we can distribute them free of cost to farmers," says Rai. The scientist however rues that it is virtually impossible for his institute to reach every agriculturist. "We have better technology, but less hands," he laments and adds that other organisations should come forward.